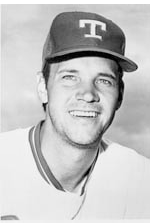 A Brooklyn native, Zisk was drafted by the Pittsburgh Pirates in the third round of the 1967 amateur draft. A three-time minor league home run champ he was called up to the majors in 1971. Zisk played for the Pirates, White Sox, Rangers and Mariners in a 12 year career. The 6-1, 208-lb. right hander batted .286 with 1,477 hits, 207 home runs and 792 RBI’s. A two-time All-Star, Zisk was chosen as the American League Comeback Player of the Year in 1981. He played in two National League Championship Series with the Pirates and had a career post-season batting average of .400. Zisk is now a minor league hitting instructor with the Chicago Cubs. Richard Walter Zisk played major league baseball for 13 seasons, gaining a reputation as one of the game’s most consistent hitters. As he enters the National Polish-American Sports Hall of Fame, he is sharing his vast knowledge of the sport with a new generation of baseball players. Richie Zisk was born on February 6, 1949 in Brooklyn. Both of his parents were of Polish heritage. His father’s original family name was “Zysk,” but was changed during the immigration process. Richie showed athletic promise at an early age, and was drafted by Pittsburgh in the 3rd round of the 1967 amateur draft. Playing in the Pirates minor league system, he became a three-time minor league home run champ. Zisk made his major league debut on September 8, 1971, and earned a permanent spot on the Pirates’ major league roster in 1973. The 6-2, 208-lb. right-hander became Pittsburgh’s regular right fielder, later moving to left field. In his first season, 1973, he hit .324. He didn’t have enough at-bats to qualify for the batting crown; if he had, he would have finished second to Pete Rose. Despite the limited at-bats, Zisk was among the league leaders in triples with seven, evidence of his line-drive hitting and the good speed he possessed prior to several knee injuries. In 1974 he proved his first season’s success was no fluke, hitting .313 with 17 homers. That season he also attained the rare accomplishment of hitting for the cycle, which requires hitting and single, double, triple and home run in the same game. Zisk had some great seasons with the Pirates, and was an important part of some outstanding teams. In 1974 and 1975 he played well in the National League Championship Series, though the Pirates lost to the Dodgers and Reds, respectively. During his time with Pittsburgh, from 1973 to 1976, Zisk averaged .299 with 17 home runs. However, he felt unappreciated by Pirates management and didn’t object when he was traded to the Chicago White Sox after the 1976 season. In 1977 with Chicago, Zisk hit .290, and reached career highs of 30 HR and 101 RBI. He also earned his first of two All-Star selections. Sox fans were thrilled as Zisk and the “South Side Hitmen” helped the team improve to 90-72, compared to their 64-97 record the year before. However, the fans’ joy turned to sadness as Zisk was granted free agency later that year and signed a very lucrative ten-year contract with Texas. The 32-year-old Zisk was traded to Seattle in 1981. Having endured five separate knee operations by that time, he became the team’s designated hitter. He started the season by hitting safely in 23 of Seattle’s first 26 games, and at one point set a Mariner record with homers in five straight games (one shy of the league record). He ended the year hitting .311 (The top hitter on the Mariners that year was fellow Polish-American Sports Hall of Famer Tom Paciorek, who batted .326). Zisk was named American League Comeback Player of the Year. Along with line drive hits, Zisk got his share of home runs, too. He had another outstanding season for the Mariners in 1982, hitting .292 with 21 homers. However, the multiple knee operations and a wrist injury started to affect his play. He hit .242 in the 1983 season, and decided to retire. When Zisk ended his 13-year major league career, he had a lifetime batting average of .286 with 1,477 hits, 207 HRs and 792 RBIs. He played in two National League Championship Series with the Pirates in 1974 and 1975, and had a career post-season batting average of .400. While no longer playing the game, Zisk is still part of the game. This year Richie was named hitting instructor for the Daytona Cubs. Last year he was roving hitting instructor, and previously coached and managed for Daytona. He managed Daytona in 2000, the last year the team won a Florida State League Championship. As a coach and manager for the Chicago Cubs organization, Zisk has helped many minor leaguers improve their skills. One was Eric Hinske, now of the Toronto Blue Jays. “My batting coach in Chicago was Richie Zisk, and he said RBIs drive big cars. … It’s something I always remembered,” recalled Hinske. Well, Richie Zisk must have driven some pretty big cars himself, because he sure drove in plenty of runs.